Thanks to the developers, iPad and iPhone have the wonderful cameras to take photos. These photos are memories which you always wants to keep in mind. Sometimes you'd like to transfer your photos in your computer to iPad and iPhone in order to carry them at all the times. To make it, you need some third-party tools to transfer the photos from/to iPad and iPhone. This article outlines the high ranking ipad photo transfer apps also for iPhone, and brings forward to you all the pros, cons and usage, so that you will never face any difficulty again in transferring photos from your iPhone or iPad. Most of them are free photo transfer apps for iPad and iPhone. Let's check them out. iPad is definitely one of the best tablets in its category with amazing features, sound quality and an excellent camera. A large number of photos is generally stored in iPad and it not only occupies lots of space but also creates problems for managing other information and data on the device. iPad will save the majority of the space by using ipad photo transfer tool and keep the backup into PC. Although iTunes can be used for transferring, some users are still not comfortable with its complicated process. There is no need to worry. 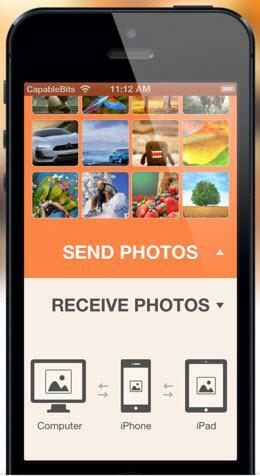 dr.fone - Transfer (iOS) is a powerful program which enables you to transfer iPad photos within a few clicks. The software can transfer photos to iPad, transfer videos, music files and other data between iOS devices, to iTunes and PC. The software allows to manage data as well as take back up and restore iTunes library so that your important data won't be lost. First of all, you need to download dr.fone on your PC and then install it. Choose Transfer from all the functions. The software is simple to install and does not have any plugin- advertisement or malware. Moreover, you don't need to install any other third party apps on your iPad device while using this software. After installing the software, connect your iPad to your PC with a USB cable . Next you need to select the photos that you want to transfer from iPad to computer. For this, under the iPad device on dr.fone interface, select “Photos” option at the top of the main interface and go to one of the given photo types: Camera Roll, Photo Library, Photo Stream and Photo Shared, or the desired album under one of the photo type. Now select the photos you want to transfer. After the images are selected, click "Export" on the top menu and from drop down menu, select “Export to PC” and then give the desired location and folder on your PC where you want to transfer the images. Once the destination folder is given, click OK and the images will be transferred there. In addition to transfer ipad photos to your PC, you can also use dr.fone to transfer videos, contacts, music from iPad to PC and vice versa. It also supports iPhone, iPod Shuffle, iPod Nano, iPod Classic and iPod touch. Fotolr is a perfect photo transfer app for iPad and iPhone. 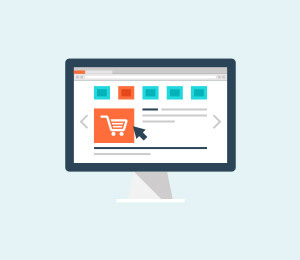 It has a nice user interface and gives you convinient without any cable to connect between your devices and the application. 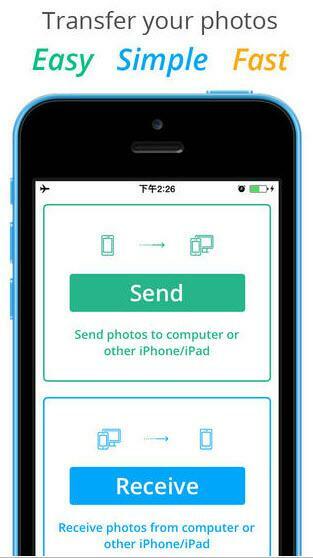 It does not only transfer photos from iPad and iPhone to computer, and vice versa, but also shares them directly to the social networking websites. It can also sort through your photos by establishing different albums and putting different photos into the different albums. The photos will be shown while you are watching a calendar and even the geographic location will be tagged to it. It's also one of the best photo transfer apps for ipad and iphone. Simple transfer has been downloaded over one million times. 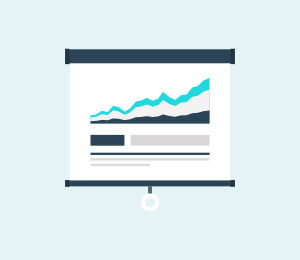 It's very easy to copy photos from iPad and iPhone to your computer and it also preserves the Meta-data of the photos. 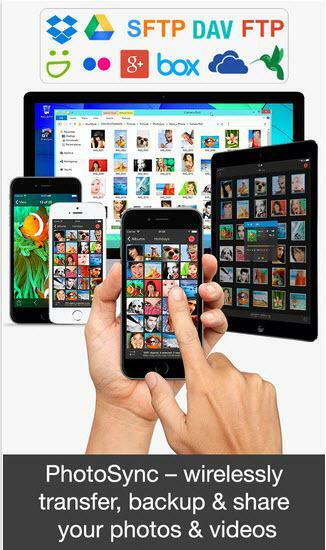 All your photo albums and videos on your computer can be transferred to your iPad and iPhone via Wi-Fi. It provides protection mechanism meaning which you can set up a pass code to access it. Also it has imposed no limit in the photo transferred size. It also works on all operating systems including windows and Linux. There is a catch though in the free version only first 50 photos can be transferred, after that you will have to pay for it. 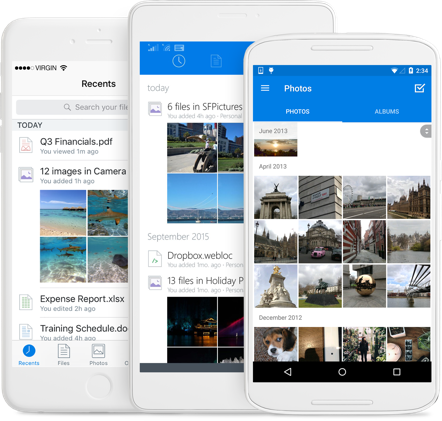 Dropbox offers a cloud-based service for you, which enableds you to take photos anywhere and share them easily. 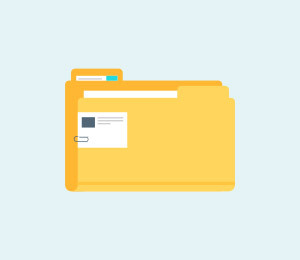 Once you transfered photos from iPad and iPhone to Dropbox, you can easily access them on your computer, web and other device. It offers you 2 GB free cloud space. For more, you will be charged for it. Also, you can categorise your favorite photos so you can preview them offline. WiFi photo transfer is also a wireless transfer app for ipad and iphone. It can be used to mass transfer as well as videos. Its best feature is that the Meta data of the photos can be also transferred, and does not require any hassle on the user side. 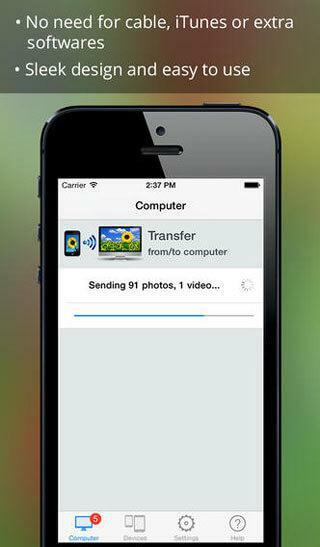 It can be used to transfer photos between iPhone and iPad as well as HD videos between any two apple devices. It can keep the metadata of the photo. 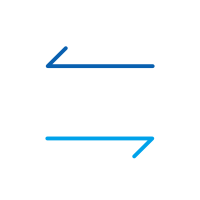 The photo transfer operates in raw format without no format conversion. 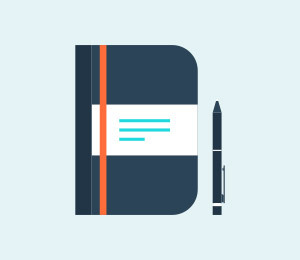 There is also a desktop application for this and the transfer can be even simpler. In addition, it can be used independently with any web browser to transfer photos. 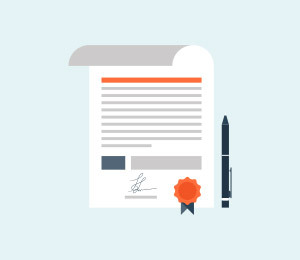 Finally, you will have to pay only once for the application and you can use it for permanence to transfer ipad, iphone photos to your computer without hassle. Image Transfer is for you to transfer freely photos between your iPad, iPhone and PC with Wifi so that you don't need any USB cable. It's very easy and reliable to use. You only need to connect your devices to Wifi. You even don't need to register with your email So you should give it a try. 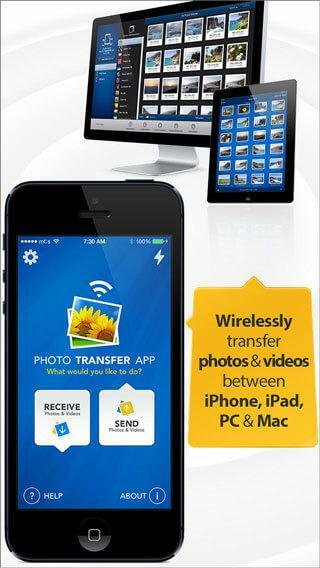 Wireless Transfer App is another photo transfer app we suggest to transfer photos for ipad and iphone. You can also use it to backup your pictures. 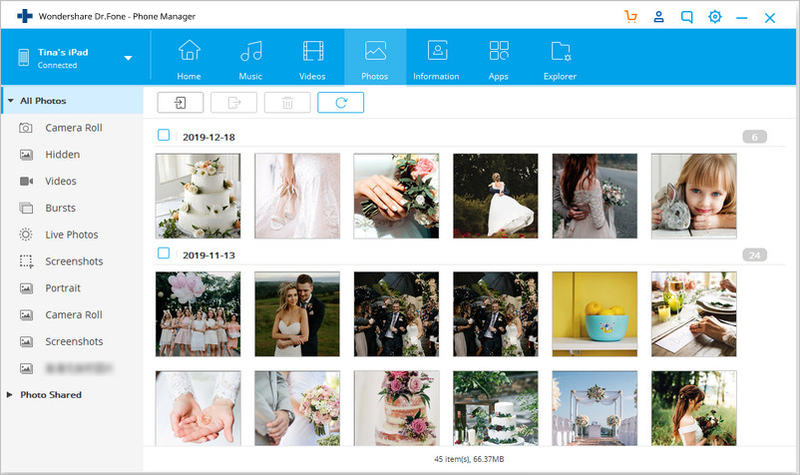 However, as compared to other photo transfer app, there is no free trial for Wireless Transfer App and it will cost you $2.99. Photo Tranfer WiFi is another option for you to transfer your photos to iPad or iPhone with ease. Its performance was ranked top 10 in 55 countries. So you should give it a go. 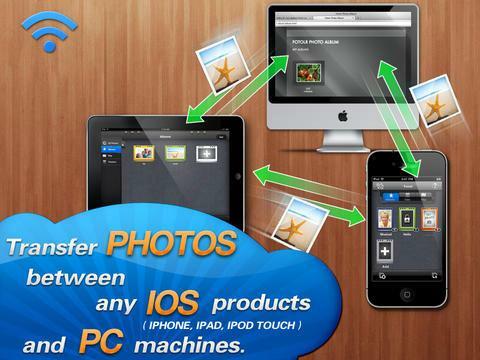 With Photo Transfer Pro, you can transfer any photos between your iPad, iPhone or even computers. 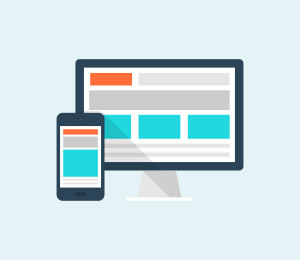 You can access your photos through a browser as long as your computer and your mobile devices are under the same network. PhotoSync, another best way to share and transfer your photos to ipad and iphone. You can use it to backup your photos as well. It's easy, comvenient and very smart to work though it will charge you $2.99. Simply download and have a try the best Photo Transfer software for iPad and iPhone. If this guide helps, don't forget to share it with your friends. No matter you've upgraded your iPad or want to share the stunning photos with friends on iPad, there are multiple ways to transfer photos from iPad to iPad without hassle. There are 2 simple ways to delete duplicate photos on iPad in iOS 10.3/9/8/7: delete manually or delete in batch with the experienced iPad transfer tool! 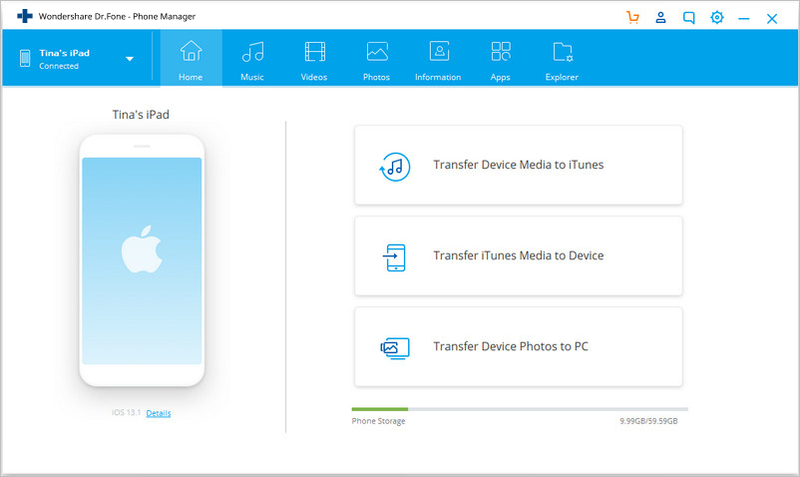 Need to transfer purchased and non-purchased items from ipad to itunes library with ease and effortless? I will show two ways for ipad transfer! Read here! How to use iPad as an external hard drive? is it troublesom? Come to have a look!I will tell you more than transferring files but more! No way available to transfer photos from iPad to flash drive? In this article, you will find the best solutions to transfer iPad photos to USB flash drive.